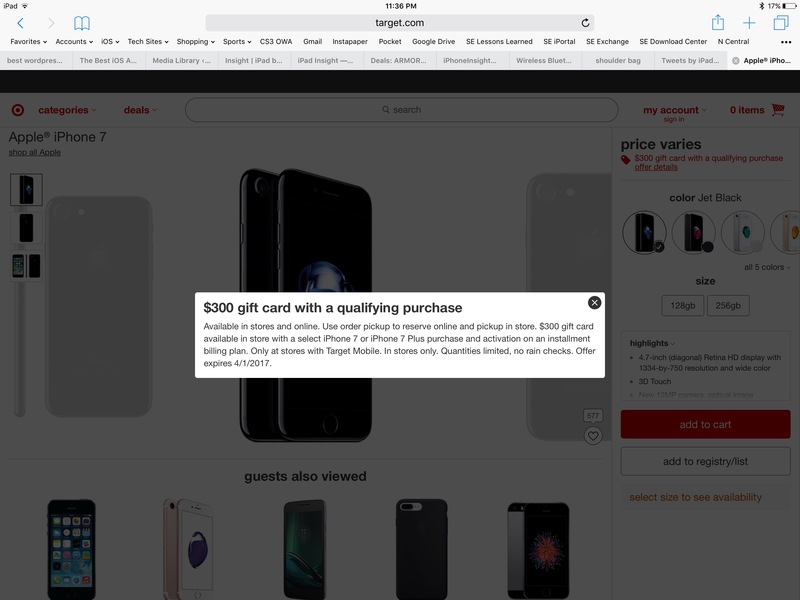 If you are a fan of shopping at Target and are looking for a new iPhone 7 or 7 Plus, this is a deal that will be hard to resist. They are currently offering up a $300 gift card with the purchase of any of the above other than the new Product (Red) version. You can’t use the card toward this purchase, but other than that, the gift card comes with no other restrictions. If this deal appeals to you, act fact, as this one will expire on April 1. $300 is a lot of money, but if you prefer not being locked in to using that savings all in one place, BestBuy is offering a little more traditional sale this week. While this deal also doesn’t include the new Product (Red) models, most of the other color and memory options are between $2.08 to $8.34 off per month. While this may not be the same as getting a $300 store gift card right up front, this sale will still net you up to $200 in savings over the life of your carrier’s payment plan. Not too shabby. T-Mobile’s deal isn’t a sale, or even a short-term special. However, it is good to be aware of, because it could make a difference for anyone who may be looking at switching carriers. T-Mobile is taking a page out of Apple’s book, and offering AppleCare Plus with their JUMP! Plans, and also as a compliment to their Premium Device Protection insurance plans. This deal not only matches what Apple offers with their Upgrade Program, but actually surpasses it if you have the Premium Device Protection plan. That actually covers loss and theft, which AppleCare+ alone does not. Paired up, these two plans make a solid combo. So, if you have been considering Apple’s own Upgrade Program or have been thinking about making a switch to T-Mobile, now may be a good time to take a closer look.